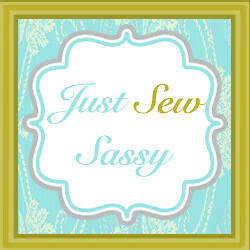 I'm Staci, and you can find me creating, sewing, baking, and attempting all things crafty over on my blog, Just Sew Sassy! Sooo... Happy Fall everybody!!! Yesterday was the first time I actually felt that chill in the air, that smell of fall, and the leaves are even starting to change!! I don't know about you, but I LOVE fall leaves. The rich colors, the crunchy sounds they make, the way they make the mountain side look like it's on fire. Leaves were the inspiration for my project today! Just FYI, my leaves are cut from an old fall garland I had, so they will keep their color. I used an old 8X10 picture as my template, and I knew I would need a piece big enough to stay behind the mat. Bright, happy little fall leaves!! Thanks again for having me today Amanda!! Hope you will all come by Just Sew Sassy and say hi sometime soon!! Yay! I love leaves and this is just perfect! Thank you so much Staci! Come back tomorrow - Lil' Luna will be here! Cute project! I love fall decor and need a few more things to display.